Text: The leaves we have seen indicate that this Book of Hours accords to the Uses of Rouen and Coutances. 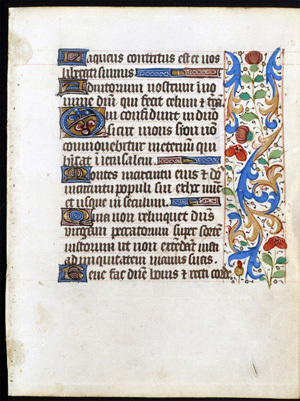 This leaf contains text from the Hours of the Virgin at Sext (Psalms 123 and 124). A scan of the verso is not currently available. Reconstruction Note! In Ege's original manuscript this leaf followed what is now Leaf 46 in the Kenyon College portfolio. Laqueus contritus est: et nos liberati sumus. Adiutorium nostrum in nomine Domini: qui fecit caelum et terram. Qui confidunt in Domino, sicut mons Sion: non commovebitur in aeternum, qui habitat In Hierusalem. Montes in circuitu eius, et Dominus in circuitu populi sui: ex hoc nunc et usque in saeculum. Quia non relinquet Dominus virgam peccatorum, super sortem iustorum: ut non extendant iusti ad iniquitatem manus suas. Benefac Domine bonis: et rectis corde. [Psalms 123] The snare is broken: and we are delivered. Our help is in the name of the Lord, who made heaven and earth. [Psalms 124] They that trust in our Lord, as mount Sion: he shall not be moved for ever, that dwelleth in Jerusalem. Mountains round about it, and our Lord round about his people: from henceforth, now, and for ever. Because our Lord will not leave the rod of sinners upon the lot of the just: that the just extend not their hands to iniquity. Do well o Lord to the good: and right of heart.